My venture into the world of reptiles was thanks, to a deep passion to understand these creatures; rescuing them was the first step in learning and appreciating their lives. 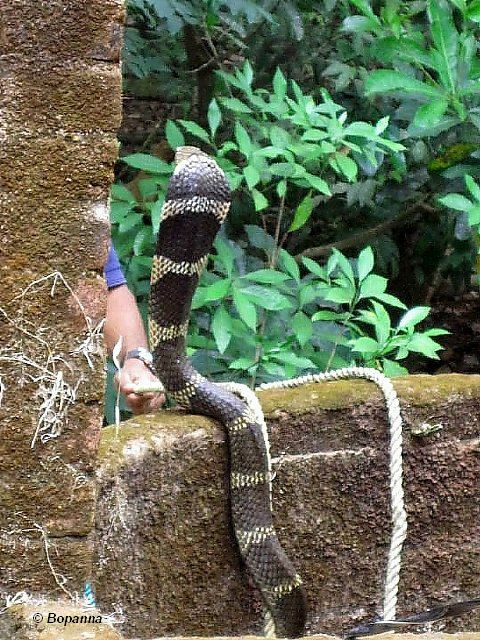 After landing in Agumbe to study king cobras, my direct association with these reptiles began at the door steps of people in whose homes or farms, king cobras had wandered into. 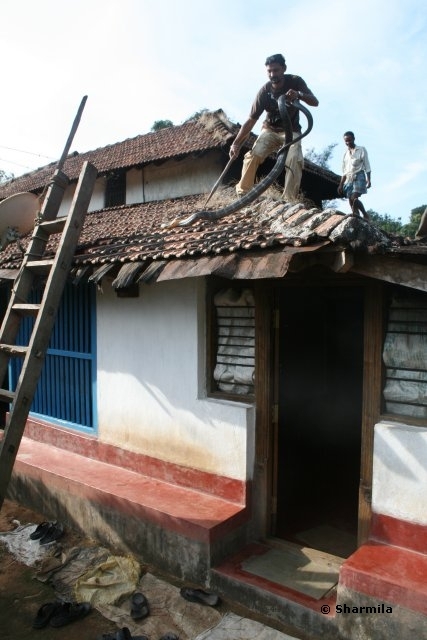 Slowly, I learnt that rescuing an eleven foot highly venomous snake from cozy, dark Malnad houses amid crowds was indeed a daunting task. From being bombarded with questions from crowds, planning my rescue strategy, being extremely alert, ensuring safety of the snake, people around and my own, my mind was reeling in a different realm. But, of course, the impression that followed after each of my rescues was of an easy catch. As it is said, “Always keep a smile on your face…It makes people wonder what you’re up too!!!”. 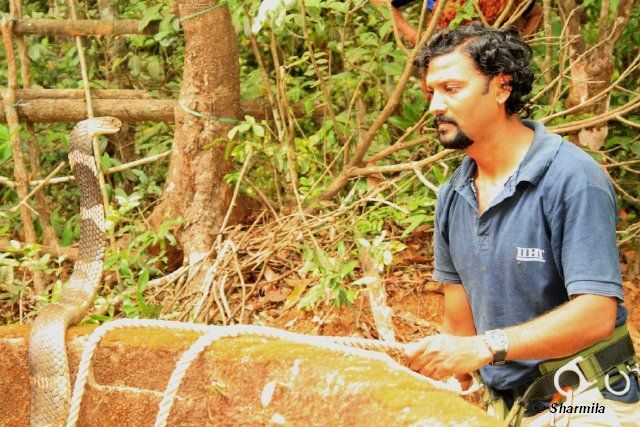 I was called for a King Cobra rescue at Thallurangadi, approx 13 km from Agumbe. Being a new face at Agumbe, my name and rescue acts had gained lot of popularity and people were very eager to see who this crazy guy was. 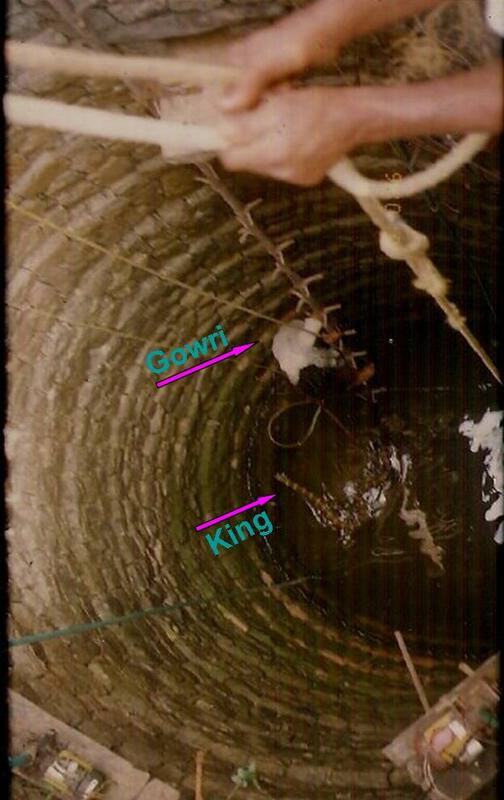 A King Cobra (approx 10 ft) had fallen into a 50 ft well with water up to 20 ft. He was desperately trying to get out. 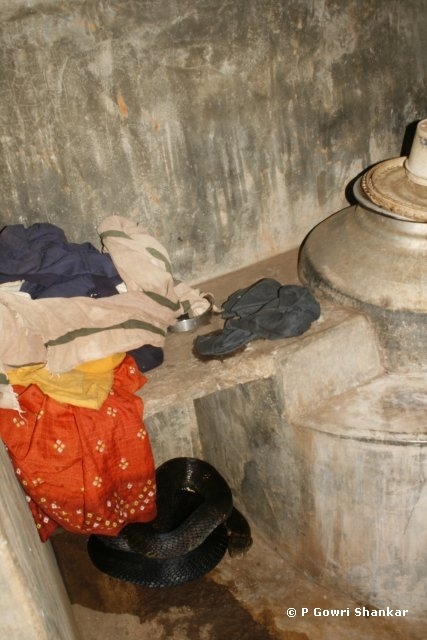 Typically, every Malnad house has a well that serves as the only source of water during summers. These are usually lined with stones that seem to droop under the burden of moss after heavy rains. 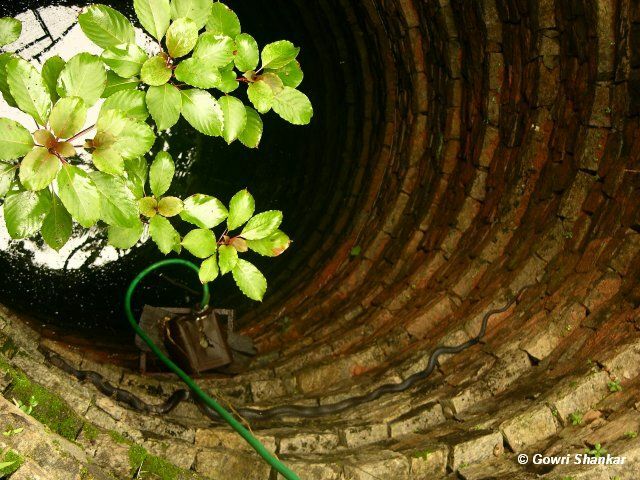 Short, dwarf like trees (like Bonsai) and ferns grow on the inner lining of these wells. 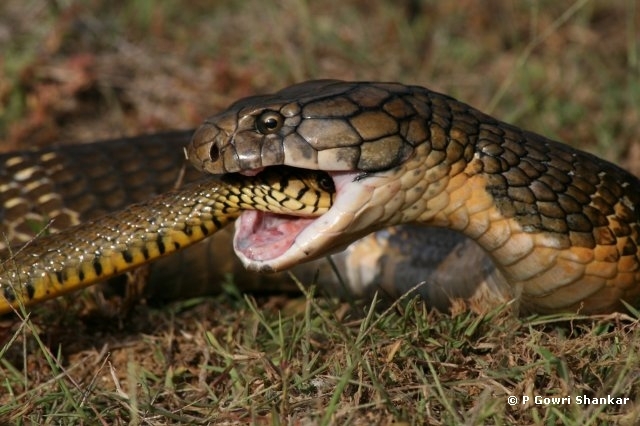 Spiders, ants, glow worms, skinks and sometimes even snakes like checkered keel-backs and rat snakes reside in this habitat. But these human structures also interfere in the way of wildlife. 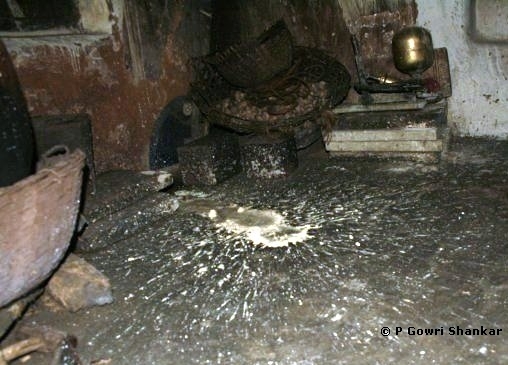 Apart from King Cobras, there have been instances of leopards falling into these wells while chasing dogs! After assessing the scene, I offered a simple suggestion- to place a bamboo pole or hang a thick rope and leave the snake alone for it to climb out. Many scorned this suggestion because it seemed to dampen their enthusiasm of watching me rescue the King! They wanted to see it being rescued and released far away from their place. My insistence to not disturb the snake only took absurd turns in their minds and they started discussing gruesome ideas of how they could kill the snake. From electrocuting, to throwing a huge boulder, to strangling, each idea was atrocious compared to the other. It was a tricky situation. Since it was already getting dark (and it is very risky to rescue the king under dull light) I managed to buy time and convinced them that I would come back for the snake early the next morning. As promised I reached the place before 7 A.M. The snake lay on a groove of the stone lined well, almost touching the water. People were already at the well, their eyes gleaming with anticipation to watch if the snake was going to be removed or if I was going to be bitten. In any case the air was filled with palpable excitement. I had worked my brains the previous night and had come up with a couple of ideas. I first attempted to lower a basket with leaf litter to coax him in. But the King took this object to be an intruder and tried to strike at it continuously. Not wanting to stress him any more, I moved on to my next plan. I requested for a bamboo pole to be placed close to the snake hoping he might take this route, but with a hundred heads peering down, this seemed far fetched too. My last resort was to go in myself. I lowered a bamboo ladder, which is basically a bamboo pole with sudden small jutting at cross angles acting as steps. Unique to this part of the state, these ladders are used while harvesting areca. Though it requires practice to use one, my situation did not offer much time for that. With my feet on the ladder and grasping on to rough edges of the stone wall I went down almost 25 feet, hardly 5 feet from the serpent! The King by this time was in the water swimming frantically. He suddenly shot up from the surface of the water hooding up and tried to strike. I stood baffled and bewildered. 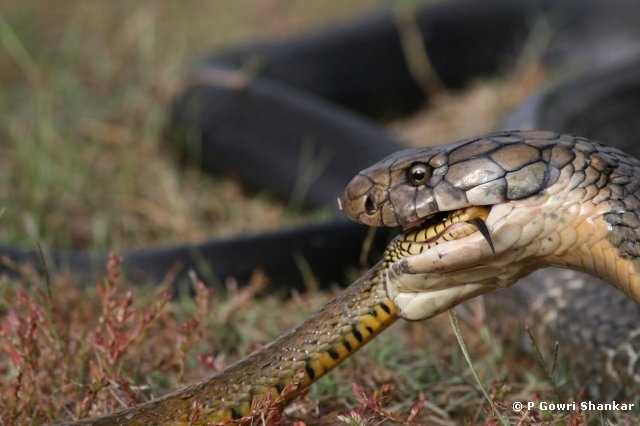 It took a while to register that a snake as heavy as 5kgs could hold its ground on the surface of water and lunge at that speed. Assessing the King’s attitude, I understood that though the snake was tired, he did have a lot of stamina that could put to shame any of my attempts to approach him. I soon devised an idea to prepare two nooses and use these to retrieve him. Time was running ahead of us and the King was getting stressed. Whatever I had in mind, I now had to execute in as short time as possible. Balancing on the ladder, with a hook in one hand and two nooses in the other, I managed to coax the snake into both the loops. 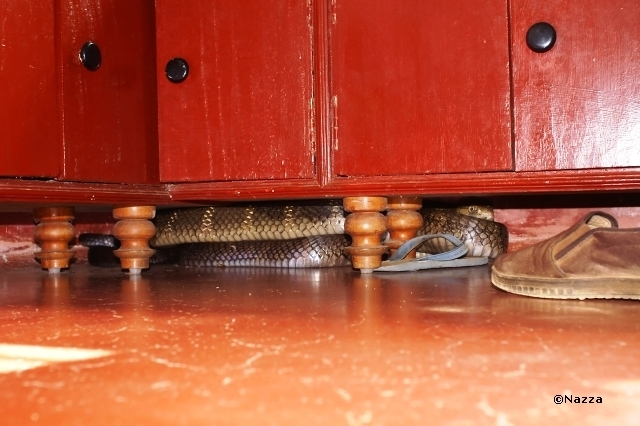 I gently fastened one loop ~70 cm from his head and the other at ~100 cm from his tail. The noose was just steadfast enough to hold the snake (not too tight not too loose), lest he break his vertebrae in his struggle to free himself. 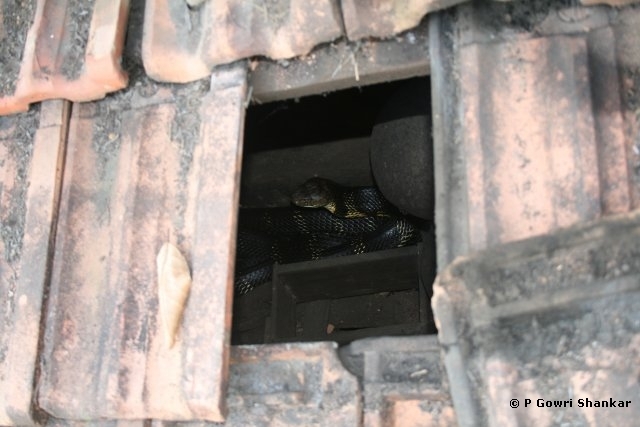 I let the snake remain in water and I clambered up the ladder to the mouth of the well. The next step was the most crucial. We had to gently draw him up, release the noose and bag him in seconds (to ensure least stress). After warning to keep a safe distance and ensuring nobody in their excitement messed with things I requested a few volunteers to control the crowd. Just as planned, with help from Shivraj (a resident) I drew up the snake as quickly as I could. Once out of the well, the snake as expected was quite agitated and seemed to exhaust all his remaining stamina in striking at me to get away. I managed to loosen the nooses and let him free for a while and then bagged him. People were exhilarated, amazed and wore faces of accomplishment. End of an ordeal...for both! As for me it was one of the most challenging rescues I had ever carried out and my reward was the safe release of the snake close to the spot of rescue. 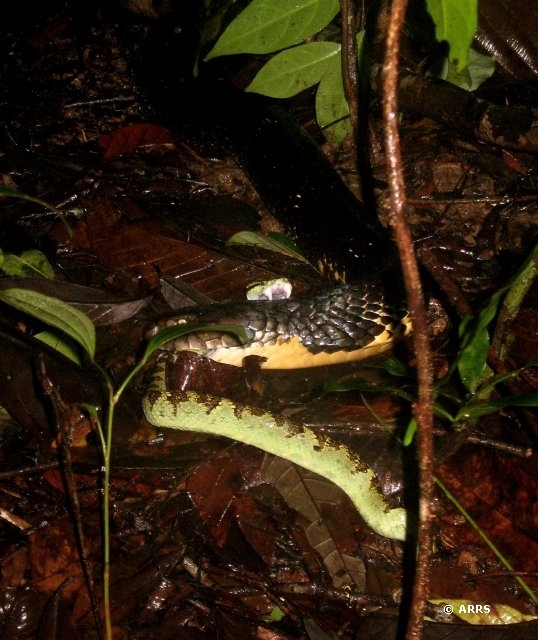 Two days later I heard of people spotting another King Cobra close to the same area. Given it was the breeding season, I suspected that these could have been mating pairs. 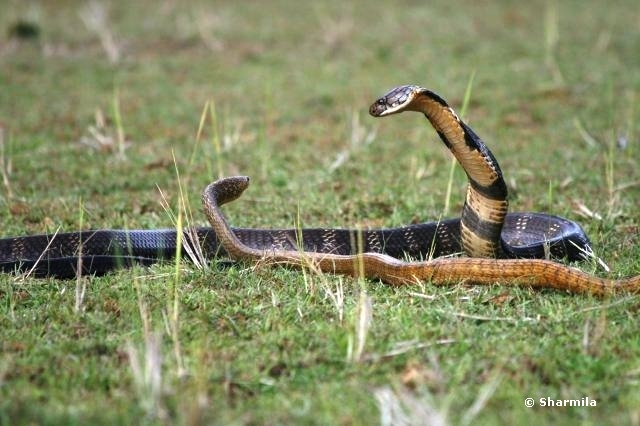 I secretly hoped that their courtship continued far away from human eyes! 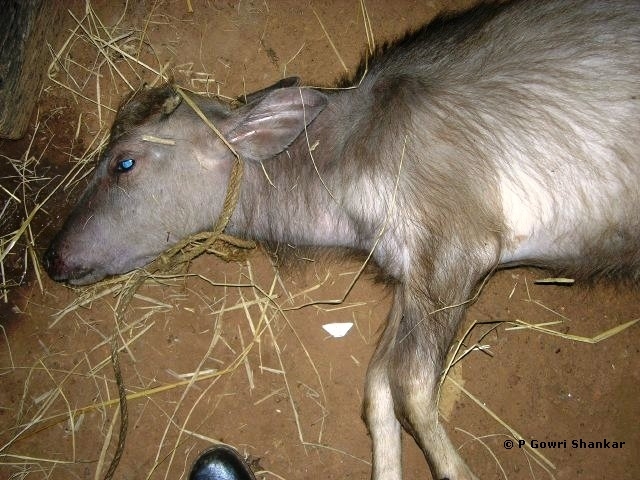 Five years later – I was called for a rescue and the situation was the same. 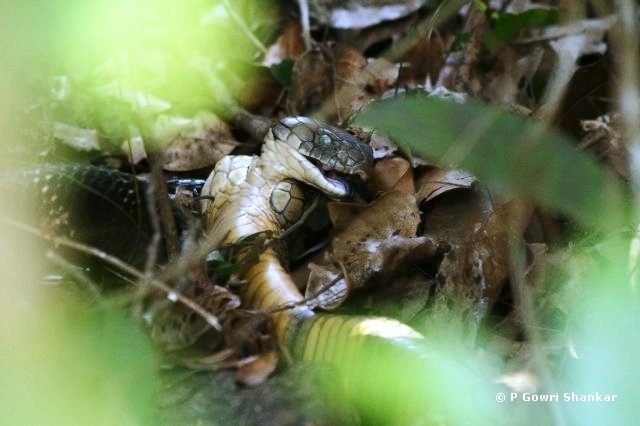 A King Cobra had fallen into a well, the call came in the evening, people wanted it to be removed in front of them and this King was part of a mating pair! The difference now was that I had rescued over 127 king cobras, was more accepted by people and had been trained in tree climbing. 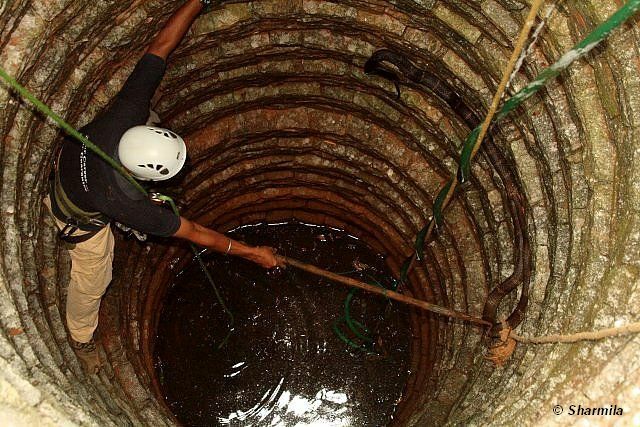 People had witnessed a male King Cobra chasing a female resulting in her fall into the well. When I reached, the male was still very close by, hiding under fallen logs, probably keeping a watch. That evening I removed the male and promised to return for the female the next morning. I went back early next morning. I found the female king cobra around 10 feet above water level, resting on a groove of the stone lined wall. 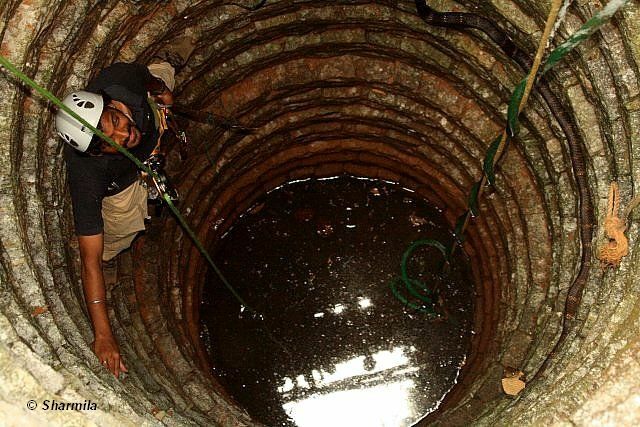 I now had to descend a well that was 40 feet deep and just 6 feet wide. Using conventional methods in the most unconventional situations is what I felt innovation and creativity was about. 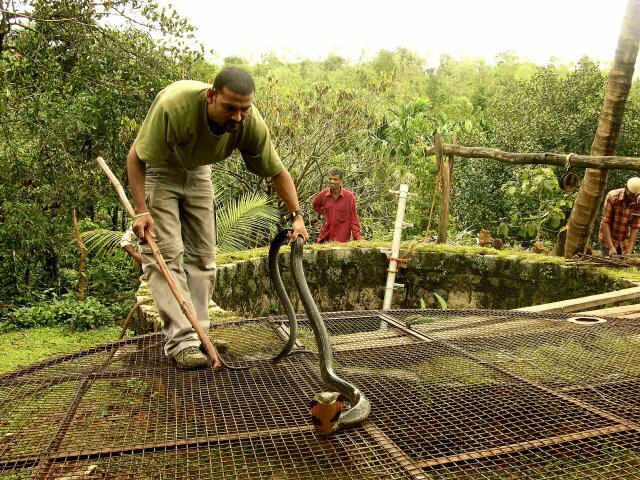 True to this belief, I decided to use my tree climbing skills and equipment to go down the well and retrieve the snake. I thank Tim Kovar of New Tribe (Thanks Tim!) for teaching me the tenets of tree climbing – I got to use these skills in the most unexpected and unorthodox situation. I used the single rope technique (SRT) and harnessed myself to a tree and then hung from the rope over the bar across the well and went straight down using an ID (an equipment used to descend) to meet the king eye to eye. With my feet precariously toed on stone edges I stood diametrically opposite to the slightly tired yet alert snake. Any minuscule error in judgment or movement would take me straight into her mouth. Prashanth, my colleague lowered a rope with a loop at its end and I used my hook, which was also sent down by a rope to coax the snake into the noose. Though she raised her hood, she played along. To avoid any injuries and suffocation, I further coaxed her to move in so that the noose was at her mid body and fastened it. A steadfast noose....not too tight, not too loose. This being the breeding season I also had to keep in mind that she could be gravid. This was one of the reasons to avoid using two nooses as compared to the earlier case. I then climbed up soon and was back on foot. We now had to pull her up as soon as possible. We did it in less than 20 seconds. Soon, the King was on the wall of the well, staring face to face. Though according to people she seemed thankless, I knew it was only our perception. She was true to what she truly was….a king! I then released the noose and went on with the standard procedure of bagging the snake. 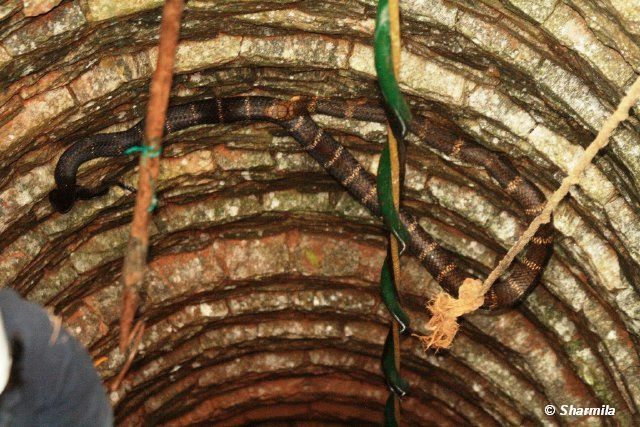 With over 127 King Cobras rescued so far, the most adventurous and nerve-racking have been the five snakes that were rescued from wells. Each situation has been unique, challenging and has demanded different methods based on the situation. Concentration, common sense, presence of mind and focus have been key elements in successfully rescuing them. However, after every rescue it has been quite a task to explain to people that their water is not really poisoned, but nevertheless they prefer to pump the well almost dry, and then to perform rituals to sanctify. 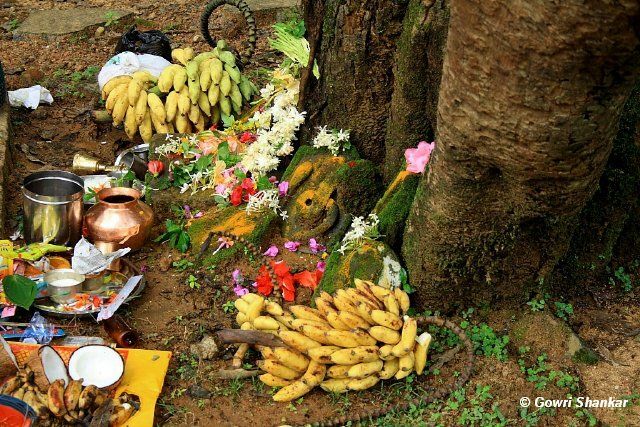 Religion and Rituals, powerful tools for conservation. I accepted this and have rarely objected – for religious beliefs are one of the strongest (sometimes the weakest too!) 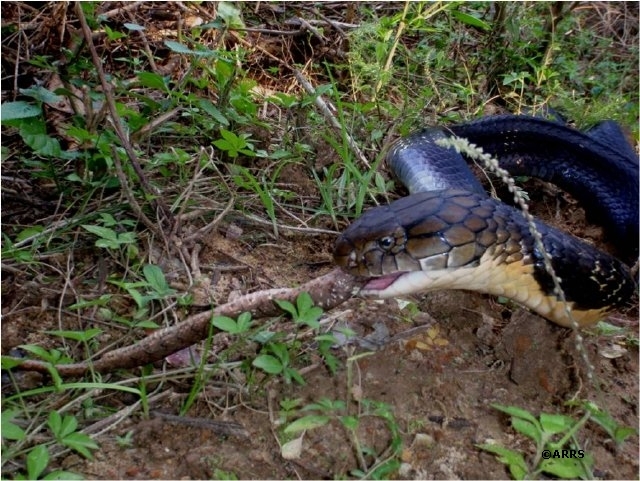 conservation tools that we have today that will ensure that the King Cobra survives in these parts of the Western Ghats.